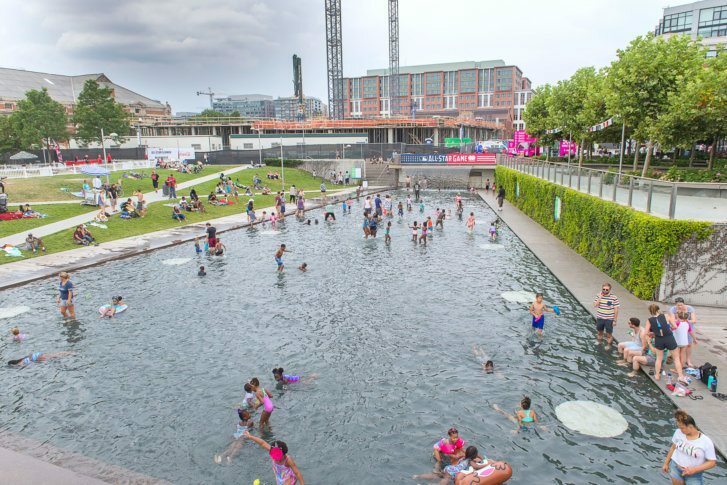 The Yards — a collection of residential, retail and restaurants within D.C.’s historic Navy Yard, and part of the Nats ballpark’s Capitol Riverfront neighborhood — is set for more growth. Its Phase 1 development repurposed some of D.C.’s oldest and historically significant buildings. “The original Navy Yard, which dates back almost to the Revolutionary War days, was a shipbuilding and munitions building plant for the Navy. It was substantially expanded to support the needs of the Navy in World Wars one and two,” Brookfield Properties’ Peter Calkins told WTOP. Brookfield inherited The Yards as part of its $11 billion acquisition of its original developer, Forest City Realty, last year. The Yards is a significant piece of the Capitol Riverfront neighborhood. “Just over 900 apartments and The Bower just opened with 138 condos. There are another 264 apartments that will deliver at the end of this year. We have about 185,000 square feet of restaurants and retailers,” Calkins said. The 225-room Thompson Hotel D.C. is scheduled to open as part of The Yards next year. Brookfield is now embarking on Phase 2 of The Yards, and has already landed its first major tenant: Chemonics, a D.C.-based project manager that works with the U.S. Agency for International Development. It is moving its Farragut Square headquarters, and 1,200 jobs, to an 11-story building Brookfield will develop. A number of large D.C. companies relocated, or plan to relocate, their headquarters from other District locations to the city’s new waterfronts — both The Wharf and Capitol Riverfront. “Companies are realizing that the Central Business District is crowded and traffic-filled, and by coming to places like The Yards, they are finding diverse, vibrant mixed-used environments, and with many options to live where you work,” Calkins said. And lots of parks — both at Capitol Riverfront and The Wharf, which can make for some refreshing lunch breaks for thousands of office workers. The Yards Phase 2, which won’t be totally built out until 2030, will boost the size of the development to 48 acres, 1.8 million square feet of office space, 400,000 square feet of retail and dining and a total of 3.400 residential units.